My real name is *checks if someone is eavesdropping* KORINA YOO (yup I'm half Korean but is much more interested in Japanese culture). I have no interest in telling more about myself. I guess a few brief discussions about me is pretty good. My only friend is the internet. 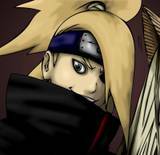 I always watch Naruto episode in the internet and I have got to say, Naruto is the BEST!! My favorite characters in Naruto are Deidara, Itachi, Gaara, and Neji. I hope its all right! Login or register to add MangekyouSharigan as your friend!